"Nervous?" "Uh, a little…" Paramount has just unveiled the full trailer for Alexander Payne's Downsizing, which premiered at the Venice and Toronto Film Festival to mixed reviews. This social satire from Payne is a hugely ambitious film where the Norwegians have invented a method to shrink humans down to a very small size - about 4 inches. The story follows Matt Damon and Kristen Wiig as a married couple who decide to get the procedure in order to live a happier, better life in a tiny city – and save the environment while at it. The cast includes Christoph Waltz, Laura Dern, Jason Sudeikis, Neil Patrick Harris, Udo Kier, Kerri Kenney, and Hong Chau. This is such a kooky concept and Payne takes it to some very weird places, as hinted at in this trailer. It's definitely worth a watch because this is so unlike anything else. You can still watch the first teaser trailer for Downsizing here, or read our Venice Film Festival review. Downsizing follows a kindly occupational therapist who undergoes a new procedure to be shrunken to four inches tall so that he and his wife can help save the planet and afford a nice lifestyle at the same time. 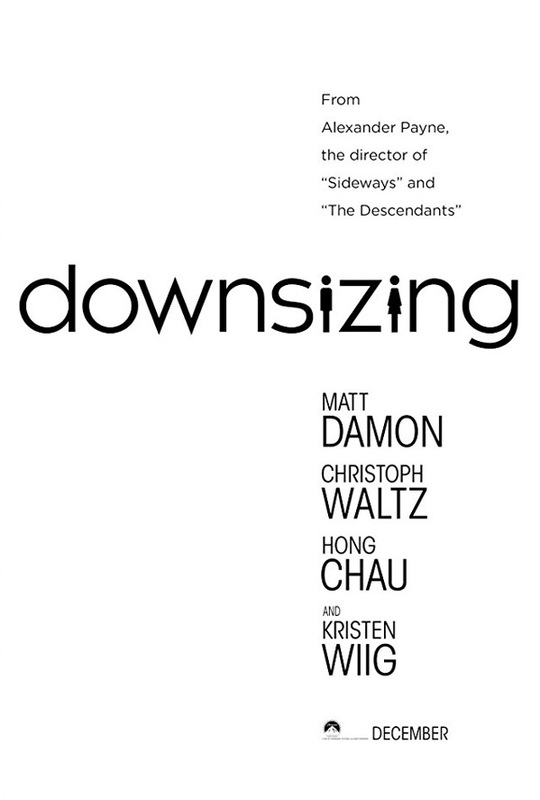 Downsizing is directed by acclaimed American filmmaker Alexander Payne, of the films Citizen Ruth, Election, About Schmidt, Sideways, The Descendants, and Nebraska previously. The screenplay is written by Alexander Payne and Jim Taylor. This is premiering at the Venice and Toronto Film Festivals. Paramount will then release Downsizing in select theaters starting December 22nd later this year. First impression?